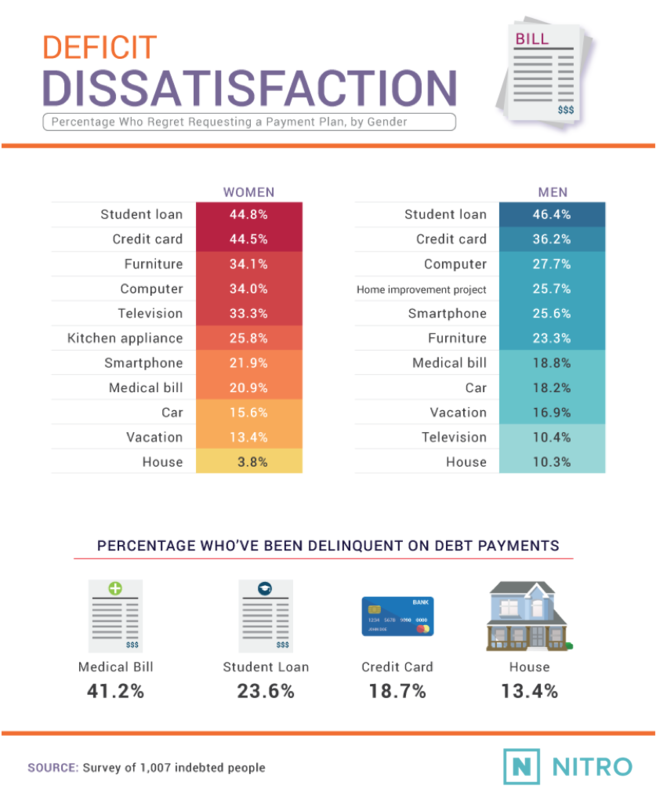 We surveyed over 1,000 men and women about their current debt obligations and their emotions connected to what they owe. Our findings revealed which loans borrowers are most likely to regret and which purchases they’d be willing to finance in the future. To see how debt impacts men and women across the country and how it’s shaped their respective financial outlooks, keep reading. Among Americans, debt may be a common denominator: 85% of respondents owed money on something they’d financed previously. The most common source of debt was a familiar culprit: credit cards. Interestingly, women were substantially more likely to report credit card debt than their male counterparts. Some experts attribute this pattern to the gender wage gap; because they earn less, women are more often compelled to use credit cards in times of financial difficulty. 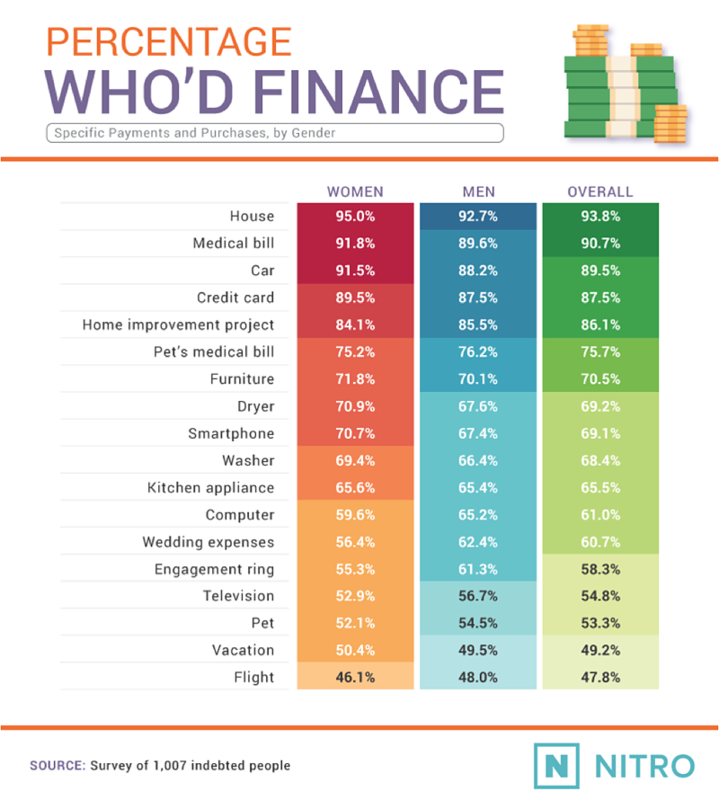 Car and home loans were also quite common sources of debt, affecting 55% and 31% of respondents respectively. Given that Americans currently owe more than $1.5 trillion in educational debt, perhaps it’s no surprise that 30% reported having student loans as well. Additionally, over a quarter of respondents had outstanding medical bills. According to experts, this issue often affects millennials who age out of coverage under their parents’ insurance plans and get sick before they can afford their own. If the vast majority of our respondents have debt obligations of some kind, which do they wish they’d structured differently – or avoided entirely? Regret about student loans was most common among men and women alike. Though refinancing may help borrowers obtain better repayment plans, their remorse likely relates more to the total borrowed than their terms: On average, student loan borrowers owe more than $37,000 upon graduation. Additionally, nearly 24% of the people we surveyed who said they have student loans reported being delinquent at some time. Credit card debt was also a source of regret for 45% of women and 36% of men, and nearly 1 in 5 individuals with credit card debt reported being late on their payments in the past. Still, it was medical debt that was most likely to produce delinquency from our respondents; more than 40% of people with doctor’s bills reported falling behind on payments. Thankfully, credit reporting agencies have recently implemented a 180-day grace period before medical debt starts to affect your credit score. As far as the size of outstanding debts, our respondents understandably owed more on their homes than any other item: $147,910 on average. Student loans ranked second, though women owed substantially more on average than their male counterparts. This finding is consistent with other research suggesting education debt disproportionately impacts women. Female borrowers owe more than two-thirds of the nation’s total student loan debt. On average, women owed more on cars, credit cards, and medical bills than men as well. This phenomenon could be attributable to the gender wage gap mentioned earlier: With smaller earnings, it’s more challenging to repay any form of debt quickly. 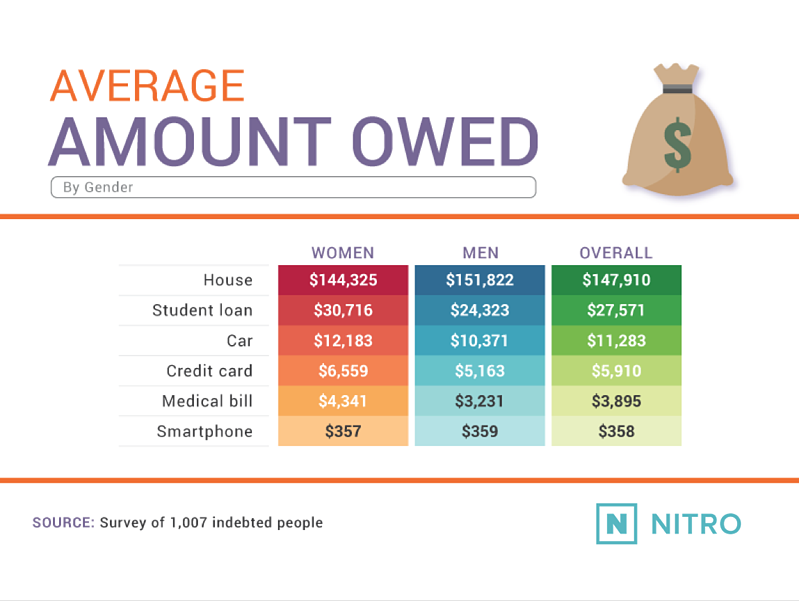 On smartphone-related debt, however, the average outstanding amounts for men and women were virtually identical. However much they owed, our respondents tended to think long and hard before pulling the trigger on another expensive purchase: Typically, they waited more than four months before moving ahead with a purchase or deciding against it. Whatever our respondents regretted about taking on debt in the past, the vast majority were willing to finance certain major expenses in the future. Roughly 94% said they’d be willing to take on a mortgage. Nearly as many individuals said they’d take on medical debt or an auto loan: In some circumstances, health care and transportation needs simply can’t be delayed. That sense of medical necessity held true for furry friends as well: Roughly 75% of people surveyed said they’d go into debt to afford veterinary care for their pet. The prospect of financing other expenses prompted far more disagreement. Approximately half of respondents said they’d be willing to finance a vacation, and just 48% said they’d be willing to take on debt to afford a flight. This finding raises a compelling question: If millennials are increasingly spending on experiences rather than products, will financing travel become more common in the future? Interestingly, more than half of our respondents said they’d finance the purchase of a pet. Paying for your beloved pooch’s medical bills is one thing, but going into debt to afford an expensive breed is another matter entirely. Our results suggest incurring debt is the rule for most Americans, rather than the exception. Moreover, a significant percentage of those who finance major expenses later reflect on their choice with some regret. Despite these important considerations, the vast majority would still consider financing to afford a future investment or improve their quality of life in the present. This finding may best encapsulate the nature of debt for the modern consumer: Borrowing remains a valuable tool to build a solid financial foundation, so long as you wield it wisely. Even as you consider future purchases, it’s not too late to reconsider the debt you’ve taken on in the past. If you’re unhappy with the repayment terms of your student loans, you owe it to yourself to explore your refinancing options. Our detailed guides can help you determine if refinancing your loans might yield significant savings and compare offers from trusted lenders. To learn if you’re paying more than you need to each month, check out our refinancing resources today. We collected responses from 1,007 people using Amazon’s Mechanical Turk. 50.6% of participants were female, and 49.4% were male. Participants ranged in age from 18 to 82 with a mean of 33 and a standard deviation of 11.66. Participants were excluded if they did not currently owe money on a past purchase or were clearly not paying attention (e.g., failed attention check questions or entered obviously inconsistent data). Statistical testing was not performed. We weighted the data to 2017 BLS data for age, gender, and race of Americans. Self-report studies have many advantages, but they also suffer from specific disadvantages due to the way that subjects often behave.These disadvantages include, but are not limited to the following: attribution, telescoping, selective memory, and exaggeration. No need to feel indebted in order to use our information and images on social media or your own website for noncommercial purposes. We simply ask that you link back to this page to attribute our team appropriately. If you do, we’ll owe you a debt of gratitude.